Definition at line 55 of file ASTReaderInternals.h. Definition at line 59 of file ASTReaderInternals.h. Definition at line 61 of file ASTReaderInternals.h. 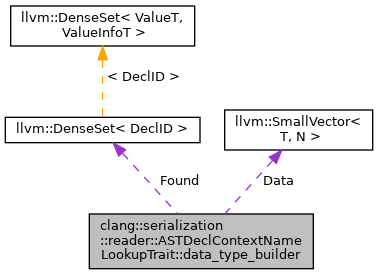 Referenced by clang::serialization::reader::ASTDeclContextNameLookupTrait::MergeDataInto(), and clang::serialization::reader::ASTDeclContextNameLookupTrait::ReadDataInto(). Definition at line 56 of file ASTReaderInternals.h. Definition at line 57 of file ASTReaderInternals.h.